Welcome Back to a New Season of Singing! Rehearsals begin September 10th for the Junior and Intermediate Choirs. As usual, Junior Choir rehearses 3 – 4pm while Intermediate Choir rehearses 4 – 5pm. Rehearsals are in the Music Room at Spring Creek Community School. This year we will be presenting a joint spring concert – Gonna Build an Ark – with the Pemberton Children’s Choir. It will be a super fun concert with music all about animals. In order to facilitate the two choirs singing together in concert, we have planned two joint workshops. The first workshop is all day at Signal Hill Elementary School in Pemberton on Saturday, October 5th. We are arranging transportation for this. On Friday, February 28th, our Pemberton friends will join us at Spring Creek Community School for an after school pizza party and singing. April 4th will be our Pemberton concert and April 5th will be our Whistler concert so mark the dates in your calendar now! Of course, we have lots more to sing for. September 21st (Saturday), we’ll be singing for UN International Peace Day in the Olympic Plaza and we have two really great songs to learn right away. Remembrance Day sees us at the Fire Hall in the village and then it’s on to the holiday season. As well as our annual concert to benefit the Whistler Food Bank (December 7th), we will be caroling through the village on December 23rd and ending up at Millennium Place for a community Christmas Sing-a-Long. Of course, December 24th is Christmas Eve and the annual Christmas Eve Carol Service. This year marks 30 years of this Christmas tradition so we’re planning to make it extra special. 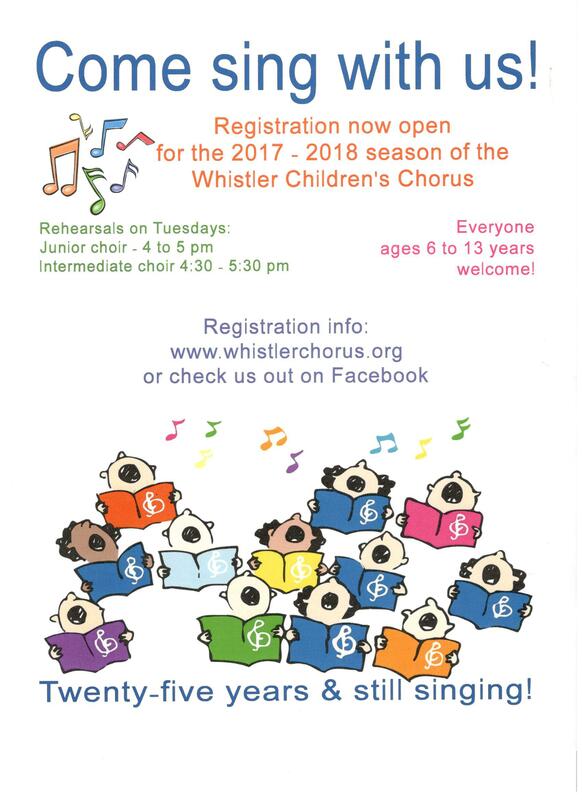 The Chorus will be rehearsing with the Whistler Singers this year – Thursdays from 7 until 9 pm at Whistler Secondary. For our older singers, this gives them the opportunity to sing larger and more challenging works of music and to sing with other more mature voices. Our young men will benefit from singing with the men in the adult choir. 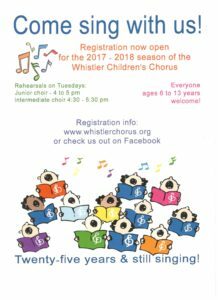 The Whistler Singers are looking forward to having your voices join in song with them. Chorus and Whistler Singers rehearsals begin Thursday, September 5th. Looking forward to seeing you there! Due to the proposed escalated teacher job action next week, we have made arrangements to hold our regular Tuesday choir practices elsewhere. As there will not be choir practice the following two weeks due to Spring Break, it is very important that we rehearse on March 6th. We will be singing at the opening ceremonies for the Whistler Cup on April 6th and we need to be ready. We will be rehearsing in the Multipurpose room at Millennium Place (downstairs). Thank-you very much for your flexibility. Don’t forget. Junior and Intermediate Choir rehearsals begin today. Come to the Music room at Spring Creek School and we will begin Junior Choir rehearsal at 3 pm. Intermediate Choir rehearsals begin at 4 pm, however, if Intermediate members would like to sing with the Juniors, you are most welcome to help them out. Rehearsals for Chorus members begin today. We have listened to singers’ concerns about rehearsal times so this year we have moved the rehearsals to after school (3:30 – 5:30 pm) on Thursdays rather than Wednesday evenings. We know that many of you have other commitments, including part-time jobs, so this rehearsal change should make it more manageable for many. Don’t forget, as a credit course, attendance counts towards your grade.